Update: Intel's Compute Stick is now available for preorder in the UK from Dabs for £129.98 (about $200, AU$250). Note that only the Windows version is available for now. 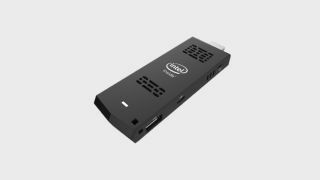 Devices like Google's Chromecast and Amazon's Fire TV brought instant media streaming to the living room, and now Intel is looking to go one further with a stick that transforms any HDMI-equipped TV into a fully-fledged PC. Unveiled at CES 2015, Intel's Compute Stick is a four-inch device that's powered by a quad-core Intel Atom Bay Trail Z3735F CPU and runs Windows 8.1 or Linux. Features include built-in Wi-Fi and a microSD slot to boost storage. The Windows version comes with 2GB of RAM and 32GB of storage for $149 (around £98/AUS$184), while the Linux option offers 1GB of RAM and 8GB of storage for $89 (around £57/AUS$110). Newegg has the Intel Compute Stick available for pre-order currently. The Windows version sells for $149 (around £98/AUS$184), while the Linux option retails for $110 (£74, AU$145), slightly higher than the announced $89 (£57, AU$110) price that was announced originally at CES. The retailer is listing both versions as not in stock currently with a release date of April 24 and an estimated arrival date of May 1. Like the Chromecast, the Compute Stick uses a micro-USB port for power, meaning it may be possible to power it using one of your TV's spare USB ports rather than a mains socket. In addition to web surfing and other common activities, Intel reckons the Compute Stick's energy efficient nature makes it suitable for on-the-move developers or business users who require remote IT support in the field. While not the cheapest way of carrying a full Windows 8.1 PC in your pocket (a Linx 7 Windows 8.1 tablet with HDMI-out can be had for £79), the Intel Compute stick will no doubt appeal to those looking for the most portable way to lug around Windows 8.1 or Linux when it lands in March.